Adaptil Collar Junior is a collar for puppies up to the age of 6 months. The collar releases soothing pheromones that calm your puppy down during the socialisation period and teach your puppy to deal with new impressions. It helps your puppy feel comfortable when you are rearing it. Adaptil Junior is a collar that gives off soothing pheromones for your puppy. It helps your puppy to get used to its new home and all of the new sights and smells in it. The mother dog also releases these pheromones to make her puppies feel calm and safe. It is important to keep the collar on your puppy for a month, even if its condition improves. To teach your puppy to deal with unknown situations, it is a good idea to continue to use the collar for the entire socialisation period (6 months). The collar can be placed around your puppy's neck and adapted to your puppy's size. Leave the collar on 24 hours a day. Only take the collar off when you wash your dog with shampoo or let it swim in chlorinated water. The collar is effective as soon as it touches your puppy's skin. The collar is suitable for puppies older than 8 weeks (neck circumference up to 37.5cm) weighing up to 15kg and works for 4 weeks. To guide your puppy for the entire socialisation period, from adoption up to 6 months of age, you should use a new collar every month. Aside from using the collar, it is important that you correctly train and socialise your puppy. 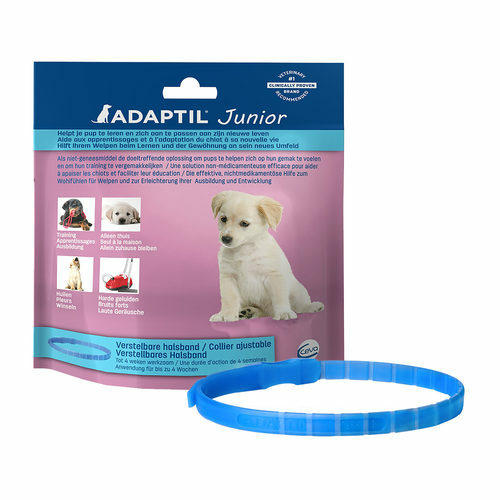 Adaptil Junior cannot be used to treat aggression against people or other dogs. Have you used Adaptil Collar - Junior before? Let us know what you think about this product.